Recently I watched a precious video of my 5-yr old DGD dancing around the tables in a cafe when a Taylor Swift song came on the speaker system. She was in her own little world as she twirled and danced around and around, pretending she was Taylor and acting out the video in her own adorable way. As soon as I watched it, this Unity image came to mind, so I pulled out the stamp, made a card, and I'll be sending this to my DGD. The card base is Pacific Point, and the mat was a white one that I colored with my orange Fluorescent Copic to coordinate with the image, which was colored mostly with fluorescent Copics. I had to make her shoes pink, since my DGD was wearing shiny pink boots in the video. The panels were all die cut with Lil Inker stitched rectangles. Her tutu was lightly colored with pale pink Copics and covered with some frosted lace stickles for a little sparkle. I'm sharing this over at the Unity Friday FWF challenge. Thanks for stopping by and make it a great Friday! I love when an image can evoke a memory. What a sweet card. Such a darling card and a darling story. Your DGD will just love it! 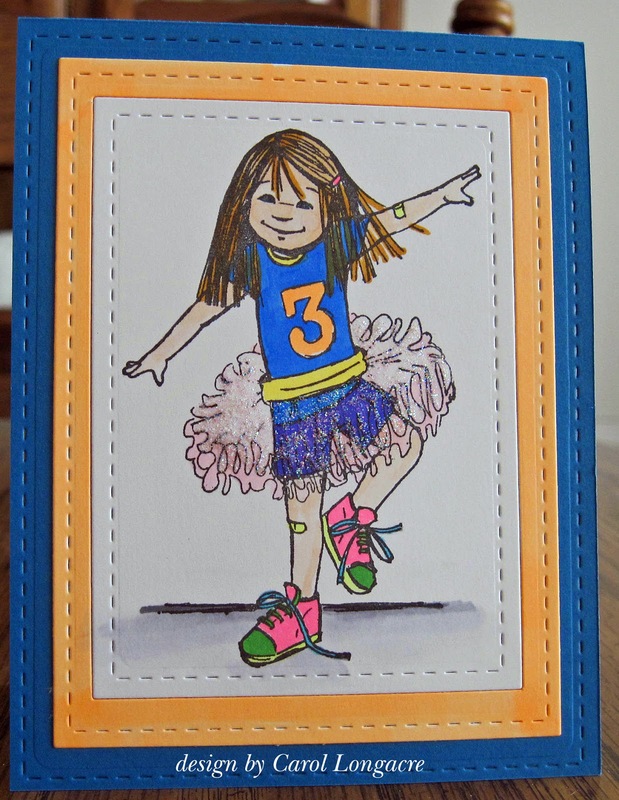 So sweet and cute card, Carol, it's fun and also be perfect for a birthday! Love the colours and the stiched frames! What a cute little card! So cute! I'm sure your granddaughter will love this card! This is so sweet. I love the bright shoes - cute little dancer. This fabulous sweet image looks great coloured with the bright flourescent pens. Your grandaughter is bound to love this card. This is just tutu cute, Carol! Heck I want to be like Taylor myself! Glad you joined in the Unity fun this week. Just as cute as can be like I'm sure your DGD was. It is a very colorful, fun card and she will treasure it. Enjoy your weekend. Carol, your granddaughter will love it!!! SO fun and cute and I do love those pink shoes! So cute!!! Aren't children the best - no inhibitions! So sweet and innocent. Pretty card and framing, Carol. This is adorable, Carol. Great design and colors! So adorable with the athletic shirt and the tutu!!! Sweeeeeeet! This image! I just love it even though I was paid in royalties for posing for it when I was small. What a fun card to match the occasion!